"I enjoy the process of cooking - beginning to end. I like knowing where my food comes from and if I can make something myself, I will. I don't like to rely on pre-packaged ingredients if I can help it." Healthy food doesn't have to be bland. 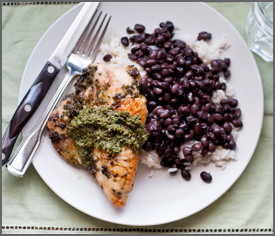 This weeknight chicken is bursting with flavor from a bright, citrus marinade laced with Latin flavors. The bone keeps the chicken tender and juicy when cooking and doesn't add any fat so you can still keep the dish healthy. If you're on a budget, bone-in chicken is significantly cheaper than its boneless alternative. Did you miss yesterday’s email?